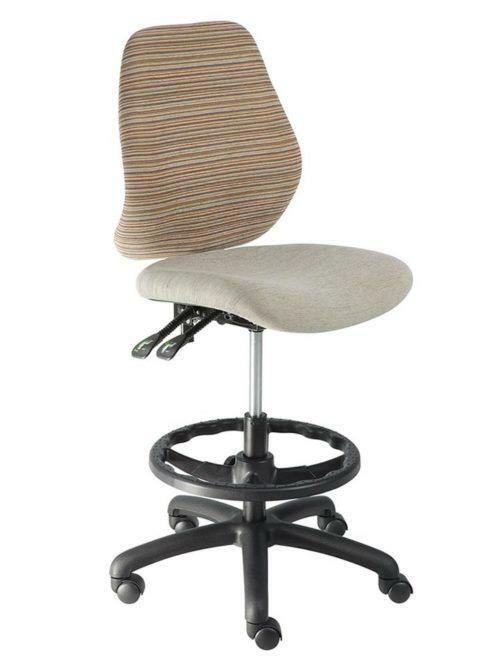 K-Mark highback chairs are sleek and stylish, and feature contoured high backs for extra lumbar support. They’re also fully customisable. You can choose from a wide choice of upholstery materials, bases and armrests, enabling you to design the perfect office chair for your needs. Our highbacks have sculpted height-adjustable shells, padded moulded foam seats with waterfall front edges and added height for optimised head and neck support, especially in the reclined position. All aspects of the chairs, from height, tilt and tension to armrests, can be easily adjusted to accommodate different body shapes and sizes. In addition, our highback chairs feature polished five-leg aluminium or nylon bases for enhanced stability, swivel function and standard castors for optimal manoeuvrability and user-friendly pneumatic height adjustment. Our highback office chairs are custom built according to client specifications. We offer a five-year guarantee on all our seating products. We use only premium quality components.